How a Cosmetic Dentist Can Boost Your Confidence Today! If you have a smile filled with chips, cracks, discoloration, or other unsightly imperfections that make you feel embarrassed, it can really take a toll on your self-confidence. One of the most prominent features people notice is your smile, so using it to your advantage can make a big difference during first impressions, dates, and even job interviews! With that being said, cosmetic services are quickly becoming one of the most commonly requested treatments by patients, so your cosmetic dentist is more than prepared. Learn how cosmetic services can make a difference in your daily life! When someone smiles at you, is your first reaction to smile back? This is the case for most people since smiling is truly a contagious phenomenon. When you see someone smile, you’re more likely to think that person is happy and confident with their appearance, especially if neither of you know each other. This is much easier to accomplish when you have a smile you’re proud to show off. Another way smiling can boost your confidence is during an interview or a first date with someone you’re attracted too. Pairing your conversation with a big smile here and there shows the person you’re talking to that you have confidence and credibility behind your statements. 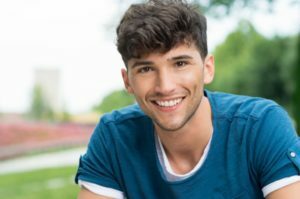 If you find yourself to be more shy, timid, or less likely to put yourself out there because of your smile, then cosmetic dentistry can make a huge difference in your life. Cosmetic dentistry is particularly popular with older patients as their teeth experience the natural side effects of aging. Discolored teeth stained over many years may be difficult to remove, but it’s not impossible through cosmetic dentistry. Even if teeth whitening doesn’t respond to deep intrinsic stains, porcelain veneers can rejuvenate them and make you look much younger. The younger you look on the outside, the younger you’ll feel inside. Just because your enamel is thinning doesn’t mean you can’t make adjustments to your appearance! It’s a great way to renew confidence that’s often lost once we hit a certain age. A brighter and whiter smile is often associated with healthy teeth as well. When people notice the quality of your teeth, they’ll unconsciously assume that you take the extra time to manage your self-care. With that in mind, they’ll start to think that you’re the type of person who takes care of others as well. Additionally, when people see others with healthy teeth, they’ll quickly assume you take the time to manage your health overall, especially considering the mouth is considered a window into the rest of the body. This will make you appear more attractive and feel more confident in the process. Your smile shouldn’t get in the way of your happiness when a cosmetic dentist can help you. Schedule an appointment with him today to get the smile you’ve always wanted! Dr. Chris Long earned his Doctor of Dental Surgery degree from the University of Health Science Center at San Antonio. During his residency, he gained extensive training on cosmetic dentistry, which allows him to provide patients many methods to boosting their smile, including teeth whitening, porcelain veneers, and dental bonding. To learn more about his treatments or practice, contact him through his website. Comments Off on How a Cosmetic Dentist Can Boost Your Confidence Today!